Great way to protect your coins from fingerprints and dust. 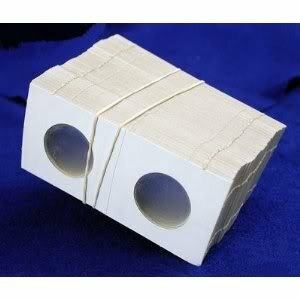 4"x 2" cardboard holders with plastic windows, fold to 2" by 2" size. Pre-scored, so they're easy to fold. Just place the coin on one window, fold, and staple the three open sides! Plenty of white space for your notes. See our Supplies category for more sizes. 2.5"x2.5" Mylar/Paper coin flip for American Silver Dollar or other coins with a diameter of 41mm. Superior quality Mylar and paper holders (flips) that have clean edges, are super clear, easy to staple and always line up. 100 per bundle. Coins NOT included. 100 Pack of Assorted 2x2 Flips. 20 of each Cent/Dime, nickel, quarter, half dollar, and silver dollar. This a great way to get your coin collection organized. It's perfect as a starter kit, as well as for experienced collectors. The RICH, BUTTERY SOFT synthetic leather is a delight to the touch. The STITCHING around the edges is a high quality touch. It has a cool retro vibe with protective METAL CORNER PROTECTORS and LABEL HOLDER on the spine. Replace the "Coins" title with your own custom title card if you like. It has SNAG-FREE interlocking rings so the pages turn smoothly without catching, and a sheet lifter is included. The album and pages are ARCHIVAL SAFE with no acid, PVC or lignin so your collection is protected and preserved. It's finely crafted to look great in your home and will last for many, many years. The kit includes cardboard COIN FLIP HOLDERS are standard 2" x 2" size, practical and easy to use. Just place your coin on the crystal clear window, fold in half and staple closed. 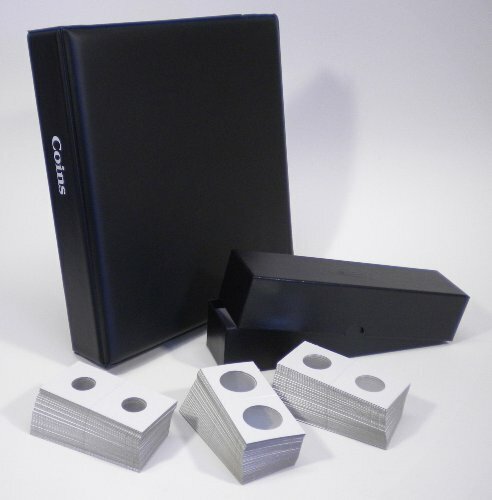 You get 200 coin holders with the kit - 100 EACH OF 2 SIZES - additional coin flips are available to fit any size coin. It makes a PERFECT GIFT for any new or experienced coin collector. Additional pages and coin flips are available separately. Coins and currency not included. FOR SMALL DOLLARS COIN; SACAGAWEA AND PRESIDENTIAL. 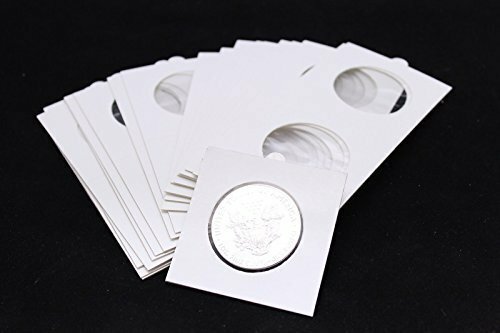 First quality coin holders Made of Durable Mylar Not harmful to coins These cardboard holders have the round windowed tough mylar plastic inserts installed. SIZE; 2x2 Simply insert coin, fold over, and staple. You will received 100 pcs. of cardboard coin holders per order. 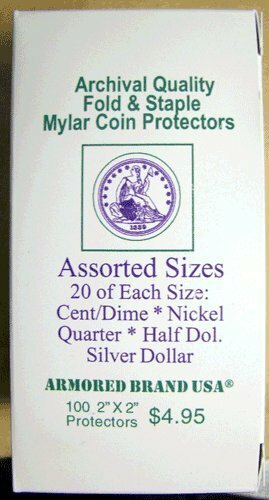 GENERAL INFORMATION; Simply place your coins in mylar 2x2 holders; staple shut. The mylar holders are completely safe for long term storage and not to mention the most inexpensive! Label the holders with a permanent marker. 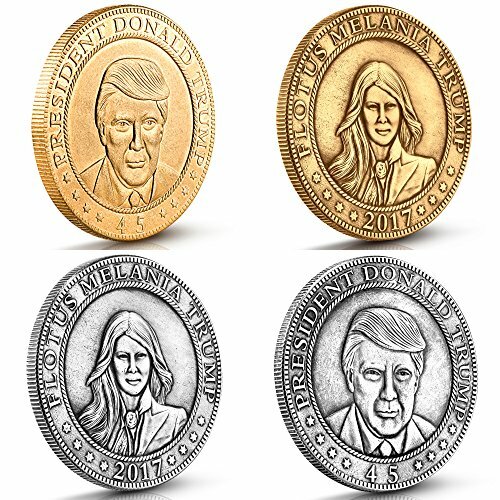 In perfect celebration to POTUS & FLOTUS, the 45th president and first lady of the United States Donald and Melania Trump, we release these exclusive historic looking distressed finish coins.These coins measures in at 39mm and are set in 2D casting with incredibly detailed multi dimensional portraits of Donald Trump and Melania Trump. Their portraits are encircled by the words President Donald Trump or Flotus Melania Trump, flip them over for a stunning depiction of the Great Seal of The United Stated.Enjoy these timeless coins, treasure them for now and gift them to the next generation! 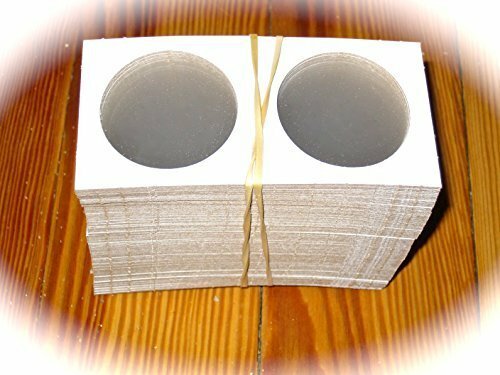 1000 +200 (1,200) Premium BCW 2X2 Cardboard Coin Holders - Mixed - Coin Collectors Deal! 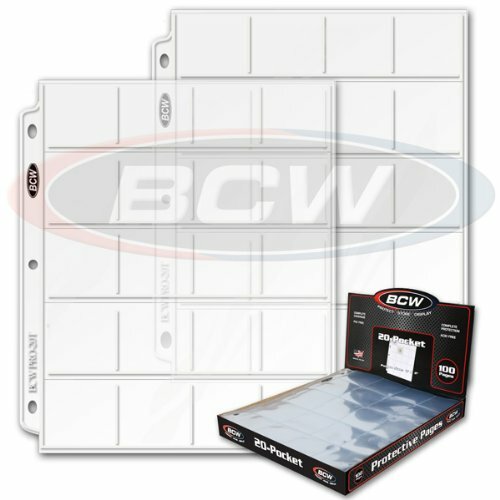 These new BCW Premium Cardboard Coin holders are ideal for short or long-term Safe Protection, Display and Storage of your coins. Made in the USA. You may customize your order to any of the following sizes: Penny, Nickel, Dime, Quarter, Small Dollar, Half Dollar & Large Dollar. Simply send me an Amazon message to customize your order. Please try to choose in groups of 100. If not that is OK too. 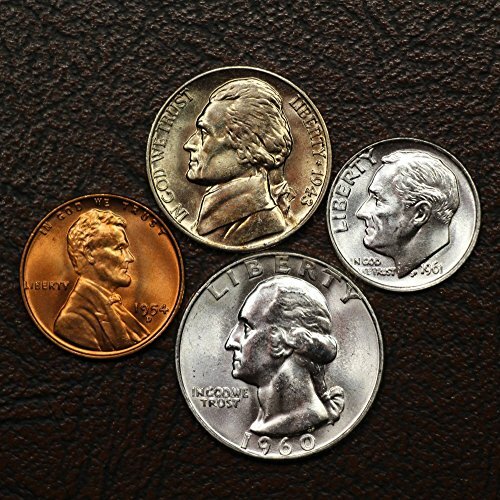 A small coin collection of 4 old U.S. copper and silver coins, including the following: 1 copper Lincoln Wheat Penny, dated between 1950-19581 35% silver Jefferson War Nickel, dated between 1942-1945 1 90% silver Roosevelt Dime, dated between 1955-1964 1 90% silver Washington Quarter, dated between 1955-1964 Each coin will be in Mint State condition (see pictures for examples), with no wear and strong luster. I will choose the dates based on what I have available.Specifications: Each coin will be secured in an archival-quality Mylar flip, and the 4 flips will be secured in a corrugated cardboard safety mailer. Each coin's flip also includes a small card with basic info on the coin. If you have any questions about these coins (or about coin collecting in general), please send me (O.S.C.) a message and I'll be happy to respond. BCW - Made in the USA Quality Products. The Holders are fold & staple and 2X2 inches in size. 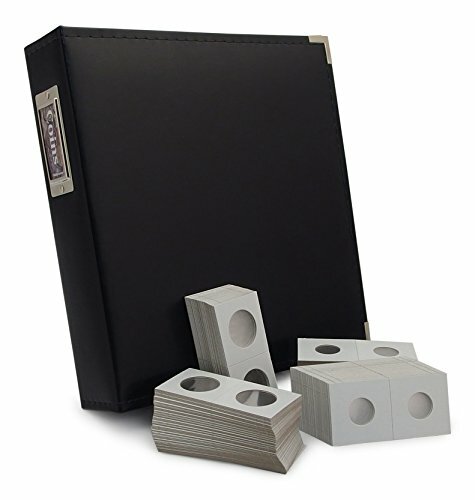 The Pocket Pages are pre-punched and cleaned to fit in a standard 3 ring binder. 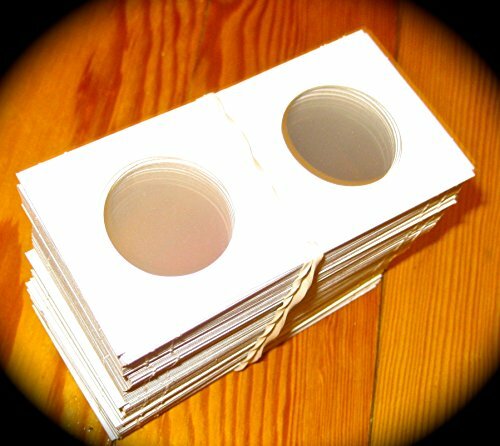 Each page holds 20 2X2 Coin Holders. Searching Sealed Bank Bags for High End Coins You Can Flip for Thousands of Dollars! Looking to Flip Coins for Thousands of Dollars? - Which Grading Company Returns More Profit? In this video, we examine two of the major coin grading companies. Which one will net you more money when you go to sell your collection? The results will shock you! Compare prices on Silver Dollar Coin Flips at ShoppinGent.com – use promo codes and coupons for best offers and deals. Start smart buying with ShoppinGent.com right now and choose your golden price on every purchase.